Getting to know the Church Fathers means getting to know our own roots. It means knowing more deeply who we are as we learn more and more about who they are. The early Christians are our ancestors, our common genealogy, our family. When we look to our roots, what do we see? In Faith of Our Fathers: While the Early Christians Still Matter and Always Will, author Mike Aquilina reveals the amazing achievements of the Fathers. They converted the pagan world in a mere two and a half centuries. They did it without any resources, without any social or political power. They did it with the most primitive communications media. Yet their Church sustained a steady growth rate of forty percent per decade over the course of those centuries. Maybe there’s something we can learn from them. This book is a journey into that world, a tour where your guides are the Fathers. Mike Aquilina is the author or co-author of over forty books, including the bestselling The Fathers of the Church: An Introduction to the First Christian Teachers; The Mass of the Early Christians; and Angels of God: The Bible, the Church, and the Heavenly Hosts. His reviews, essays, and journalism have appeared in First Things, Touchstone, National Catholic Register, and elsewhere. Aquilina is the Executive Vice President of the St. Paul Center for Biblical Theology and along with Dr. Scott Hahn has hosted several popular television series on the Eternal Word Television Network (EWTN). He and his wife Terri live in the Pittsburgh area with their six children. 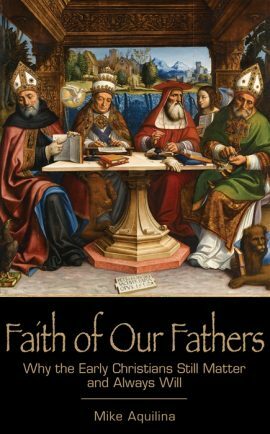 Be the first to review “Faith of Our Fathers: Why the Early Christians Still Matter and Always Will” Click here to cancel reply.